Home What are the Symptoms of Honda Ignition Coil Failure? 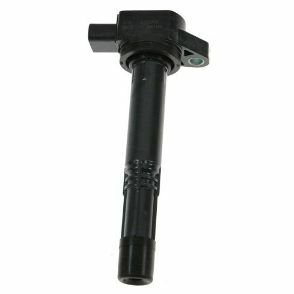 What are the Symptoms of Honda Ignition Coil Failure? The engine compartment of your Honda Civic or Accord is a harsh environment at any time of year. But in the summer, especially, the extreme heat from being parked outside under the baking sun combined with the vibration from your engine and vents open to the elements can cause the electronics under the hood of your Honda to break down and fail. One of the most common failures we see during the summer are the ignition coils. Unlike your first car which probably had an ignition distributor and spark plug wires, most cars today use a single ignition coil, mounted on top of the engine, for each spark plug. In this type of system, known as "coil-on-plug," the engine control unit (ECU) feeds a precisely timed signal to each coil that triggers the spark that ignites the fuel and air mixture in the cylinder. When an ignition coil fails, that cylinder can misfire which triggers a check engine light. A misfire from a failed ignition often feels like a stumble or hesitation when you're on the throttle, or like an intermittent hiccup at idle and you'll often see a decrease in your fuel economy. However, sometimes a partial failure in a single coil will cause a misfire only some of the time and may not trigger the check engine light. While an ignition coil that has failed or is just starting to can be very frustrating to diagnose, a misfire in your Honda engine can be very damaging if left too long without repair. In a running engine with a misfiring cylinder, unburned fuel that was not ignited is pushed through the exhaust where it causes damage the delicate grid of the catalytic converter, shortening its lifespan and leading to costly replacement down the road. That unburned fuel and air mixture can even explode inside your exhaust system causing even more damage to sensors, a turbo if equipped, the exhaust manifold, or the muffler. By necessity, any electronics in the engine compartment are engineered to be robust. But because the ignition coil is bolted directly to the engine, it is particularly susceptible to the vibration and heat the engine produces during normal operation. In the past, we’ve opened a few of the failed units we replaced and found that small cracks appeared in the circuit board or that some of the small electronic connections became detached, especially on high-mileage vehicles. Unfortunately, ignition coils aren't designed to be individually serviceable and instead need replacement when their circuitry breaks down. If your check engine light is illuminated and you think you might feel a misfire, have the fault codes scanned by a reputable mechanic to determine which cylinder has the bad coil. Replacement is easy: just removed the old ignition coil from the top of the engine and unclip the electrical harness connector, then simply reverse the process with the new part! On many high-mileage cars with one or more failed ignition coil, it can be easiest to simply replace all 4 or 6 units on the engine before the rest can do the same. Just use the search box above to specify the year and model of your Honda and we'll ship your new OEM Honda ignition coils right to your door! If you're unsure of which coil or other parts you might need, just give one of our knowledgeable parts associates a call by phone at 1-877-674-5525, or send an email to orders@bkhondaparts.com and order with peace of mind that you're getting the right parts supplied by your Honda experts!